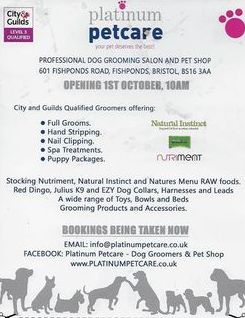 We should like to wish great good luck to our loyal supporters Kim and Megan of Platinum Pet Care in their new venture, a grooming parlour and pet shop, which opened today. Happy to be able to tell you that Herbie the whippet has found his forever sofa with Jane and Nigel Litten and their family. We all hope you have a long and happy life together. Millie. 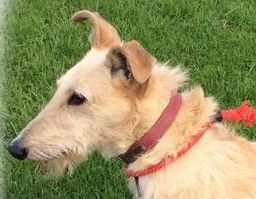 formerly Lily, is a beautiful little lurcher who has now found her forever home with the Dixon family and loves their other lurcher Murray very much. He also loves her, so they send a big thank you to all at DAWG for bringing this little girl into their lives. Millie on the left above and Murray on the right. We would like to say a massive “thank you” to Support Pet Adoption for the wonderful support we receive from them. Torday whilst collecting in the Eastgate Store, Kev, the Store Manager, presented Gerry with a fantastic cheque for £339.38 from the Summer Fundraising Drive. 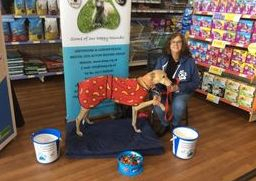 Thank you to everyone at Eastgate for supporting Bristol DAWG. Eila sent a private message to Gerry this morning which she would like to share with all you lovely people who very kindly supported the DAWGUST Appeal. Not every dog which is saved by Eila will come to Bristol DAWG as we obviously can only afford kennelling for so many, but Eila will get these dogs to other rescue organisations. The money raised has enabled her to save more dogs and she is so grateful to everyone who supported DAWGUST. Above is a picture of one of the dogs who she would not have been able to save had it not been for DAWGUST. 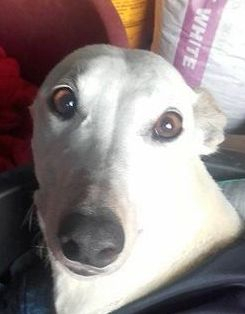 This is the one Gerry's heart particularly goes out to, an old greyhound which was at the local pound, but safe now thanks to Eila. 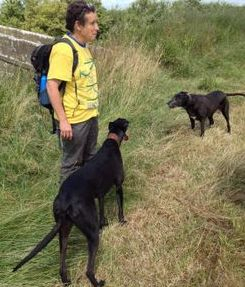 Billy would like to invite you to join him on a guided ramble on Saturday from Trowbridge Station to Melksham Station. The 10:22 train from Bristol Temple Meads will get you (and up to two dogs per human ticket holder, dogs free of charge on the train) to Trowbridge at 10:54 for an 11:15 start to the walk. Buy return tickets to Melksham and you'll be covered for the ride back too - probably on the 15:21 or 15:48 train. Just a few days to go to go ... train from SWINDON at 10:36 on Saturday 15 October from CHIPPENHAM at 10:53, or from MELKSHAM at 11:02 to Trowbridge. Walk from TROWBRIDGE STATION at around 11:15 to Melksham (Station) via public footpaths, the Kennet and Avon Canal towpath, visit Whaddon and the ancient Pack Horse Bridge over the river Avon, and be back to Melksham. This is 'styled' as a lurcher and longdog walk, as it's going to be avoiding the difficult stiles and cattle-field sections. Other medium and large dogs, and people without dogs welcome. Do bring a bottle of water, snacks, stout shoes. Should be back at Melksham Station for trains at 15:21 to Chippenham and Swindon and 15:48 back to Trowbridge. Up to two dogs per person travel free of charge on the train - not allowed on seats, mustn't make a nuisance of themselves. Free parking at Melksham Station. Buy your train ticket on the day. We would like to say a huge “thank you” to Support Pet Adoption for the wonderful support we receive from them. Yesterday whilst collecting in the Bradley Stoke Store, Phil, the Store Manager, presented me with an amazing cheque for £302.69 from the Summer Fundraising Drive. Thank you to Phil and his team at Bradley Stoke for being so friendly and welcoming. 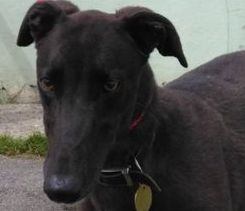 We wish good luck to our handsome lurcher Denzel as he leaves us today to start a new life with his forever family. Have a long and happy life together all of you. Meet our new girls who should be with us in about two weeks time. We may possibly have a boy arriving as well, but details still to be confirmed. All these lovely girls have been lucky enough to have been saved by our very good friend Eila in Ireland. Rosie, Emily and Vicky. 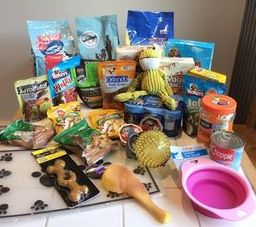 Only seven days left to win this doggie hamper. It will be delivered to the winner's door or place of work by courier. Many thanks to Mrs Godwin for her kind donation. Everybody at Bristol DAWG appreciates your generosity. Welcome to Emily and Rosie who arrived in the early hours of this morning and, as ever, many thanks to Kristie and James for getting up to take delivery and settle them in.